Adorned with beautiful copper ivy leaves, this 3 test tube hummingbird feeder is our most popular hummingbird feeder, year after year. It's easy to handle, easy to use and easy to clean. Plus, the design is such that it can not drip! 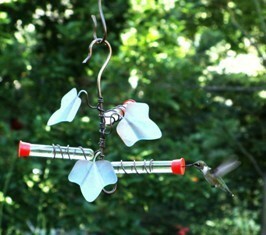 Each feeder tube has a red cap that quickly attracts hummingbirds. Perfect plant hangar. We suggest hanging a fuchia plant from the extra strong hook below for maximum attractiveness. Handmade in the USA.